The 3-A Approved OMEGA™ PRS-TMM12 series transducers are designed for use in Sanitary or Hygienic Clean-in-Place applications in the Food, Dairy, Beverage and BioPharmaceutical industries. These transducers are manufactured with 316L stainless steel housings that meet the dimensional and finish requirements of 3-A Standard 74-03 and ASME BPE-2007, and are welded and processed to provide a clean, smooth, 32 microinch or better surface finish in the wetted areas for Clean-in-Place processes. The probe stems are manufactured in two configurations; standard duty probes with a ¼" diameter probe, and a heavy duty design with a stepped 3/8" to 3/16" diameter probe design for good response times. The OMEGA™ PRS-TMM12 series transducers are identical to the PRS-M12 RTD sensors except for the addition of a built-in 4 to 20 mA transmitter inside the housing. This eliminates the need for a separate transmitter when a 4 to 20 mA signal is required for your instrumentation. The housing cover can be removed allowing for the adjustment of the transmitter's zero and span settings. 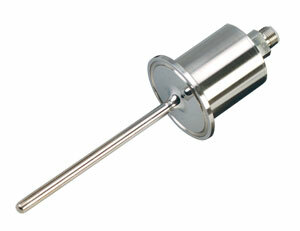 The TM2M12 model ranged to provide a 4-20 milliamp output between -18 and 93°C (0 to 200°F). Other ranges are available as special orders, please consult our sales engineers. A 4-Pin M12 Connector provides a quick and convenient connection point for process wiring. Simply install an M12 extension cable to the sensor to connect it to your monitoring or control instrumentation. Standard mounting flange is 1½"-16AMP Tri-Grip in conformance with ASME BPE-2007. Thermal response time of 2.5 seconds or less in water flowing at 3 ft/sec (63% response). 4 to 20 milliamp output proportional to temperature (see ranges available). Supply Voltage 8 to 35VDC, 24VDC recommended. Maximum temperature range is -50 to 200°C at the sensing end, 85°C max at the connector end. Extension cable with straight 4-pin female M12 mating connector and polyurethane jacketed cable 2 meters (6.5') long. Extension cable with straight 4-pin female M12 mating connector and PVC jacketed cable 5 meters (16.4') long. Extension cable with straight 4-pin female M12 mating connector and polyurethane jacketed cable 5 meters (16.4') long. Extension cable with straight 4-pin female M12 mating connector and PVC jacketed cable 10 meters (32.8') long. Extension cable with straight 4-pin female M12 mating connector and polyurethane jacketed cable 10 meters (32.8') long. Extension cable with a right angled 4-pin female M12 mating connector and polyurethane jacketed cable 2 meters (6.5') long. Extension cable with a right angled 4-pin female M12 mating connector and PVC jacketed cable 5 meters (16.4') long. Extension cable with a right angled 4-pin female M12 mating connector and PVC jacketed cable 10 meters (32.8') long. Extension cable with a right angled 4-pin female M12 mating connector and polyurethane jacketed cable 10 meters (32.8') long. Nota: Please consult sales for other flange diameters, styles and probe lengths.